"Go Irish!" 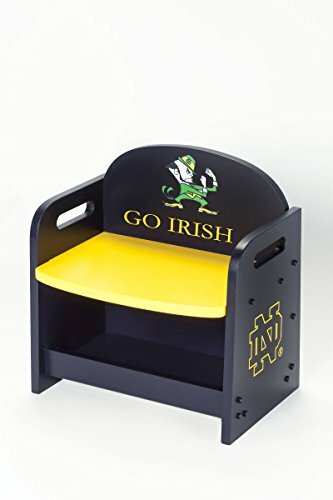 See your little one's eyes light up as they watch the game and cheer from the best seat in the house-that is, from their very own Lil' Leprechaun Bench. Hand crafted from Baltic birch veneer and sanded to ensure smooth, child-safe edges, this bench is great for children from 18 months to 4 years. It even has storage space below the seat, perfect for holding everything from teddy bears to a pot of gold. The iconic Leprechaun in-laid in the back and the ND Monogram on either side will surely give your children the spirit of Notre Dame. All of our products are hand finished with water-based paint and fully tested. Ships fully assembled. 15.375"W x 16.375"H x 10.125"D Made with Irish pride in South Bend, Indiana USA The name, logo or indicia featured in this product are protected trademarks of the University of Notre Dame.